Jon Sutherland, who holds the U.S. record for most days running a mile, poses in his CSUN cross country uniform. Photo by Lee Choo. On May 26, 1969, 18-year-old Jon Sutherland sat underneath his favorite tree near the California State University, Northridge baseball field and prayed. Sutherland ’78 (Radio-Television Broadcasting), who had suffered a 95 percent tear of the peroneal nerve in his lower leg eight weeks prior, was cleared earlier that day by his doctor to start running again, but was unsure how his body would hold up. Forty-eight years (17,573 days and counting), 195,000 miles and a U.S. record later, Sutherland hasn’t stopped. 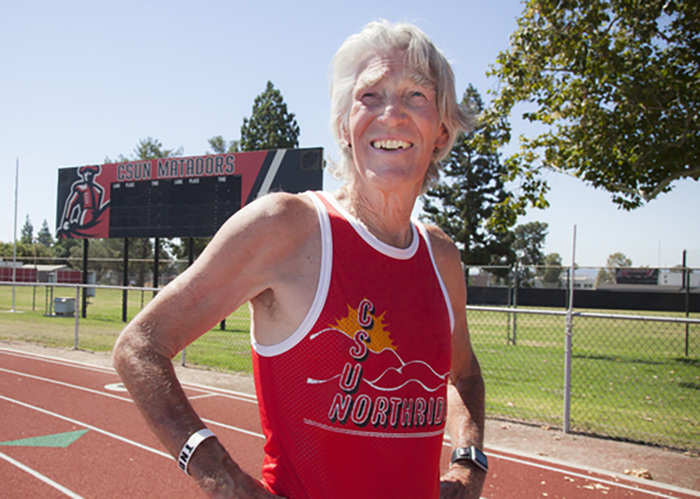 For nearly five decades, Sutherland has run at least one mile a day. Many of which — 60,000 by Sutherland’s count — have come at CSUN. “I was nicknamed ‘Lord of the Loop’ because of how many times I ran around CSUN,” Sutherland said. Sutherland didn’t just run as a hobby. He had a decorated cross country career as a Matador, having broken six school records, including the 2-mile and 3,000 meter. He also ran (and beat) many of the world’s best runners in competition. On May 27, 2014, Sutherland became the U.S. record holder for most consecutive days running at least one mile after passing longtime friend Mark Covert, the same person who inspired him to start the streak. Covert, who started running a year prior to Sutherland, ended his streak after his 45th anniversary. For Sutherland, one year quickly turned into decades, while the one-mile-a-day minimum set by the United States Running Streak Association has been almost nonexistent in his world because he usually surpasses the mark in each of his runs. According to Sutherland, he has averaged more than 11 miles a day since he started. However, it hasn’t been that easy keeping a streak alive for 48 years. In total, Sutherland has broken 10 bones and has had arthroscopic surgery in both knees. He also suffered an avulsion fracture in his hip while running a half-marathon in 1988 where muscle pulled off his bone. After graduation, Sutherland spent years as an accomplished music journalist, editor, and publisher, interviewing the likes of Ozzy Osbourne and Metallica. Luckily, there was always a park or road he could sneak off to for a quick run on his lunch break. As far as the streak is concerned, the 66-year-old has no plans of stopping. Sutherland, who is the head cross country coach at Chaminade High School, said he’s running three or four miles a day right now due to a nagging back injury, but hopes to get up to eight miles soon. CSUN means more to Sutherland than just the birthplace of his 48-year streak and the institution he learned important writing skills. The memories, both on and off the track, have remained with Sutherland every mile he runs.